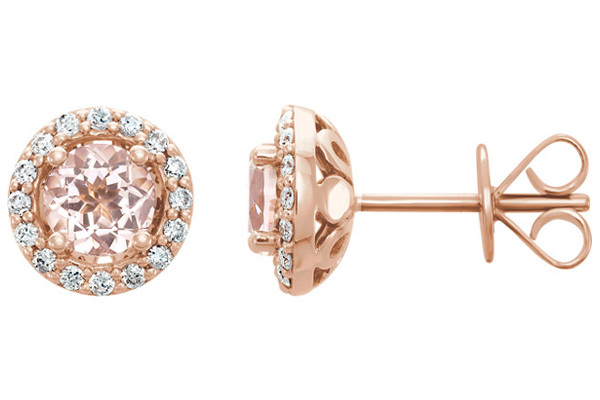 These 14K rose gold morganite and diamond halo earrings from Apples of Gold Jewelry are the perfect earrings for the special lady in your life. 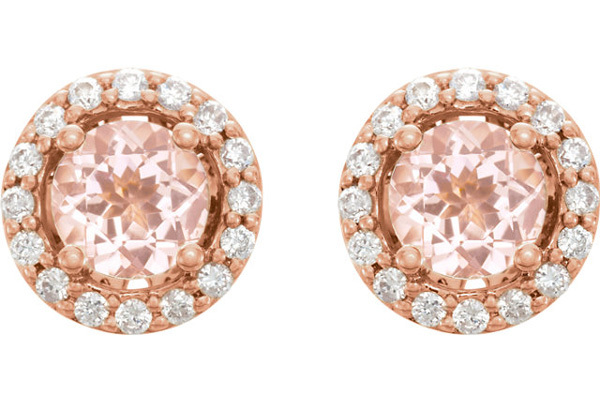 These beautiful earrings are made from 14K rose gold, with a soft pink hue that compliments the authentic 5.10mm round morganite gemstone, which is also a soft pink hue. Each gemstone is 0.43 carats, totaling 0.86 carats. The overall dimensions of these earrings are 5/16" and 3/8" in size. Along with the stunning pink morganite gemstone, these earrings feature 32 diamonds for both, weighing a total of 0.22 carats with a color rating of G-I and a clarity rating of I1. The friction-post push-back closures allow for secure wear. These earrings are available with a matching pendant, as well. We guarantee our 14K Rose Gold Morganite and Diamond Halo Earrings to be high quality, authentic jewelry, as described above.